This post is long overdue since my son is now 14 months old but I’d thought I’d share some photos of his nautical inspired nursery. I love how it turned out and had so much fun making things and finding things that would be perfect for the room. As soon as we found out we were having a boy, I knew I wanted to do a nautical theme in his nursery. Homegoods had a ton of great nautical stuff that I found right before the summer. I found the crib bedding on Etsy and the curtains are from Pottery Barn Kids. I also did a bunch of DIY projects. I had an old dresser that I bought from Ikea years ago and decided it would make a great changing table/dresser but needed a little make over. I used Annie Sloan’s Chalk Paint for this project. 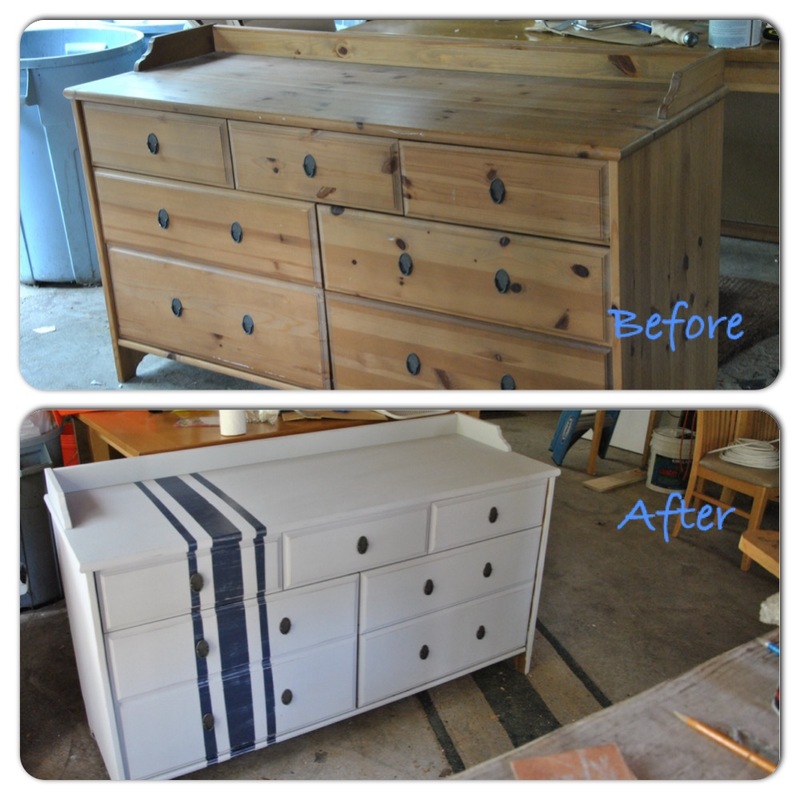 I painted the entire dresser using Paris Gray and then used painters tape to add the navy lines. Another project was the mobile. I decided to sew felt shapes to go along with the nautical theme. I do not sew. Ever. So anyone can do this project. First, I printed out the shapes that I wanted and cut them out of felt. Make sure you cut out two of each shape for each piece because you will be stuffing them with cotton. After the shapes are cut out, I started sewing the shapes closed with needle point yarn. I wanted to be able to see the stitches. And they are definitely not perfect but I like the way they turned out. Before you stitch all the way around, stuff the shape with cotton batting. You can get the batting at any craft store. I used fabric glue to glue on the detail pieces. I then threaded the shapes along with some pom poms onto a long piece of yarn and attached each one onto a craft ring. The next thing I made for the nursery were nautical flags that spell out Collin’s name. I went to this website to see the nautical alphabet. I then painted each wood block with the appropriate flag. The decal over the crib is from Etsy. I wanted to make a gallery wall over the dresser so I made a few pieces to add to the pieces I found at Homegoods. Once all my pieces were complete, I traced each one on scrap paper and cut them out. I used the paper to plan out my gallery wall before I hung anything. It’s much easier to move paper taped to the wall and saves a lot of unnecessary holes in your wall. These three pictures were done by my step-father who passed away 7 years ago. He had Parkinson’s and still continued to paint until the end. I found these when I was going through some of his painting and thought they would be perfect for the nursery. I really love the personal touches and how everything came together.